During a visit to the institution on Tuesday, His Eminence wished the students success in their careers of solidarity and humanism, as he wrote in the Book of Honor of the school after touring the center and meeting with a group of students, many of them Catholic. 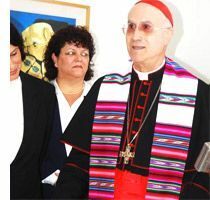 Cardinal Bertone thanked the Cuban government for creating a school that allows young people from all Latin America and other regions of the world to receive training in such an important field as medicine. Several students expressed their appreciation for Cardinal's visit to the institution and highlighted the fact that they are being trained based on principles of humanitarian values and solidarity.